One of the best things about running university workshops is the fantastic questions and involvement by students. In this case there were students from many different courses, which made for a more diverse conversation throughout the evening. 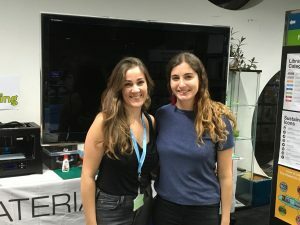 We had questions about sourcing our own ingredients, the change in properties depending on recipe variations, development of biomaterials and applications for future products by manufacturing with digital fabrication techniques. 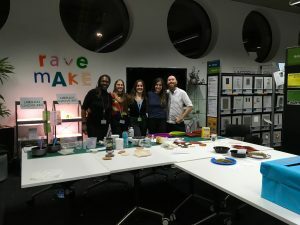 During the event, we made several recipes using natural powders as colourants as well as experimenting with different moulds… even one of the students had created her own mould to test an agar-beetroot bioplastic. It was an absolute pleasure to work with the Ravensbourne and their Library team during their event. NB: I was also really happy to visit Ravensbourne as I had attended the university to do my Foundation diploma in Art & Textiles from 2006-2007. It was at the older site in Chislehurst, but it has kept the familiar creative and inclusive attitude.